HawthoRNe offers a bracing combination of fast-paced professional crises and personal tensions. 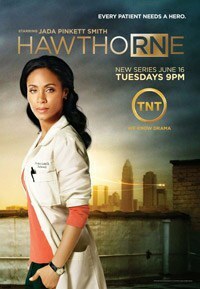 With HawthoRNe, Jada Pinkett Smith becomes another of TNT's strong women. Like Kyra Sedgwick in The Closer and Holly Hunter in Saving Grace, Smith brings movie star wattage to the small screen, playing a complex character who asserts her will in her own professional environment but finds her personal life harder to manage. At Richmond Trinity Hospital, Christina Hawthorne (Smith) is the Chief Nursing Officer. She battles for her patients, explaining to one social worker, "I jeopardizes my job every day" for the good of her patients. Her foes include incompetent doctors who talk down to nurses, hospital administrators with their eyes on the bottom line, and the kind of bureaucratic red tape the health care system produces on a daily basis. Still, she has her own issues. The premiere episode starts with her awake from insomnia, talking to her dead husband's ashes. We learn that he died a year ago from cancer, and she feels she was unable to save him. As she lies pondering the anniversary of his death with equal parts grief and steely resolve, she gets a frantic call from a cancer patient threatening suicide. She's the kind of nurse her patients can call at 5am, knowing she'll rush to rescue them. While granting her heroic status, the show also considers serious social and political questions. On her way to work, Hawthorne pauses to speak to a homeless woman she knows, stationed outside the hospital door. As she appears disheveled, owing to her haste that morning, a new security guard assumes Hawthorne is homeless, and suggests she head to a shelter instead of the hospital. When she rushes past the guard anyway, pushing him out of her way, cops arrive on the scene to drag her away to face assault charges. Yes, she's a rule-breaker and advocate for the less fortunate. And yet, even after her harrowing morning, Hawthorne is all business, telling her nursing staff: "Let's just let it go and keep it moving." When her friend, Chief of Surgery Tom Wakefield (Michael Vartan), tries to get Hawthorne to take a day off, she refuses, asserting, "This is home." That's not to say she doesn’t have a home, as well as a daughter Camille (Hannah Hobson). Her high school principal calls to say Camille is about to be dragged off for chaining herself to a vending machine that's about to be removed. Ostensibly, she's protesting lack of choice for students, but like her mother, she's driven by other concerns. This much is clear when she introduces her mother to the principal by saying, "My mom let my dad die." Both adults concur that detention might be good for Camille. Hawthorne faces another sort of displacement with her mother-in-law, Amanda (Joanna Cassidy), a hospital board member. The women refuse to talk about how Hawthorne's husband died and Amanda's belief that she is "unreliable." All they can agree on is sharing custody of the dead man's ashes. HawthoRNe's bracing combination of fast-paced professional crises and personal tensions is leavened by the banter she shares with fellow nurses and their somewhat comic dating tribulations. A male nurse, Ray Stein (David Julian Hirsh), faces his own trials in a female-dominated field, a storyline that makes for some fresh takes on hospital politics. While some subplots are trite (a nurse turns down a paramedic's romantic overtures, saying she's "damaged goods"), the premiere hums along whenever Hawthorne is driving it.